In the rest of the session, we looked at the last parts of intrinsic value by valuing commodity companies and companies with intangible assets. We then moved on to the contrast between value and price and how the gap between value and price is perceived by investors with different investment philosophies. Last session we were talking about doing financial service companies the dark side evaluation let's continue on the dark side. So let's. Next look at. Companies with intangible. Let's play the game. You have a company that tangible assets of four questions remained the same. What are your cash flows what's the value of growth. How risky are you. When will you become a mature. No it makes it difficult to value companies with intangibles. Is the accounting is all messed up. In what sense the earnings are early not the earnings because your biggest CapEx is an operating expense are. And if you can if you expense are indeed everything get screwed up your income gets screwed up you invested capital that screwed up your return on capital get screwed up every aspect of valuation becomes more difficult. So your big problem of valuing intangible assets is not that we don't know how to do and accounting has screwed up. So let's look at the basic and consistent basic inconsistency that accounting faces when it values pharmaceutical companies technology companies is and gets treated as an operating expense. So we talked about what we need to do right. We need to capitalize on ending its pain in the neck. I don't like to do it but I have to do it because if I don't capitalize R D then I'm going to get a skewed vision of the company and it's not just ARDE. It could be brand name advertising for a consumer product company it could be recruiting expensive or a consulting company. We almost have to go back and do the basics so I'll take you back. And this is a throwback in time. This is actually the Amgen example that we talked about we looked today only our deeper. So what I'm going to do is let it play out. I'm going to look at how capitalizing our Indy plays out in the numbers. So there are my aready expenses pharmaceutical company I'm using a ten year life for the R D so go back and collect the R and D for the last 10 years. And then I go go through the data I write off one head every year and I keep track of how much I'm writing off which is in the last column month 694 million is what's going to show up it's an expense this year and how much has still not been written which is almost thirteen point three billion. So what I'd like you to focus on are the unadjusted numbers is what you're going to see in the income statement and the numbers I'm going to restate with our Indee capitalize. So my unadjusted net income is four point two billion but one skycap I capitalize are indeed that income jumps to5.5 billion my book value of equity is seventeen point nine billion. If I trust the accountants but if I capitalize on the jumps to thirty one point one billion my return in equity is twenty three point five percent. If I trust the accountants but if I capitalize on that. So every number ships. 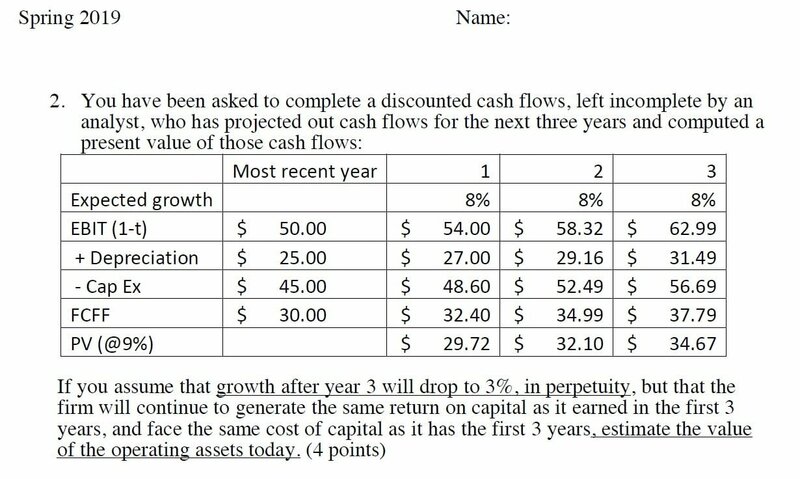 So when I do my valuation with ARDE capitalized I'm going to be using very different Baseer numbers very different returns and capital attaching a very different value to growth. I don't even get a very different perspective on risk. So I want to show you my valuation of Amgen with ARDE capitalize and then I'm going to ask you a question does capitalizing on a and b affect the value of Amgad. That's a stupid question because of it. Why would you go to this dance. But. If you remember an Excel spreadsheet you can actually turn off the RNC or turn it on. We can see the effect in value so if your cap lights are indeed you can try this on your company. So here's what I had as my original valuation of Amgen in 2007. I capitalize R and D I used the capitalized numbers the numbers that I got with the already capitalized as my base of Baseer they were reinvesting 107 percent return in capital of sixteen point seven percent that's the R and D capitalized return on capital gains. I get a growth rate of nine point six percent again using my definition of reinvest roots includes Ardian Mitre 10 capital and I make the most stable growth for them off to 10. So cutting to the chase if I value them with my capitalized numbers devalued Pichette that I guard was seventy four dollars per share. Stock was trading at 55. Stock was undervalued. And if I believe my own valuation I should buy the stock. So here's my question if I go off and go back to the original accounting numbers if had to capitalize on the would have got a higher value for Amgen or a lower value for Amgad go look at the next slide because that kind of gives away the answer because scandalizing is going to cut both ways right. It's going to mean I have lower earnings but I also have lower book value or higher returns on capital so they going to be good things that happen and bad things that happen. Which do you think is going to win out. So if I don't capitalize on India to go back to the original accounting numbers. So income will be down rather tons and Gap will be higher. Some of value growth will be higher. Right. So the net effect might cut both directions. In this case or in all cases. Sergeant what happens in this case.